Not a huge fan. Love most Mountain Hardwear products, but this one is just not up to standard. I think it is mostly the fault of the Conduit DT laminate. Not a huge fan. Love most Mountain Hardwear products, but this one is just not up to standard. I think it is mostly the fault of the Conduit DT laminate. It is designed to be waterproof breathable, but not sure that it is either. If there is any significant amount of rain it gets very clammy inside. Hard to determine if this is due to lack of breathability or lack of waterproofness. It doesn't get overtly wet under the faucet, but feels a little clammy on the inside. I think there is some "micro-leakage" of water through the membrane and combine with poor breathability and a plastic feeling on the inside of the jacket, you get a wet clammy feeling on the inside, which is what this type of jacket is supposed to prevent. When you combine sweating on hike and rainfall, I am downright soaked on the inside of the jacket and might as well not wear it. The fit under the arms is a bit baggy and odd as well, most MH items fit me great. This does allow for plenty of range of motion, but looks weird wearing around. A few years out and the laminate is starting to peel. I think the lesson is to stick with Gore-Tex, but there are some new fabrics around which may be as good (I.e. eVent). Haven't tried to contact them about warranty or guarantee, but may check. Overall MH makes really good stuff, but this is an outlier possibly due to outdated waterproof/breathable tech. I bought this jacket about two years ago because I needed to change from my Marmot Precip who was old and delaminating after seven good years. I like the stretchy part and after using it found it gave me a little more room when reaching out. Considering breathability I long ago let go of the fact a waterproof shell is supposed to be breathable. That’s why I use softshells every time I can. That being said once you open the collar and the pit zips it’s not as bad as some tend to say. Compressibility is fine; all roll up in the hood it takes about a litter and a half of space. It sheds the elements well and as for the lifetime warranty I’ve had no issues. I just received a brand new one from MH after it delaminated in the left wrist. There are better options out there considering price tag though. 200$ is a bit expensive for a PU coated shell. If you find a good deal for it, get it. You shouldn’t regret it if you keep in mind the above. 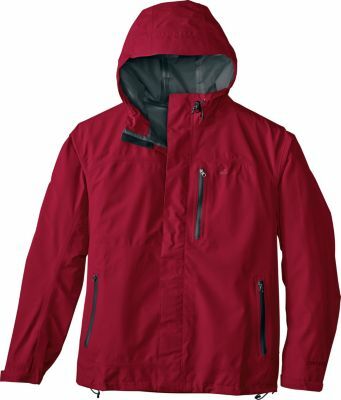 This jacket is super lightweight and very waterproof. 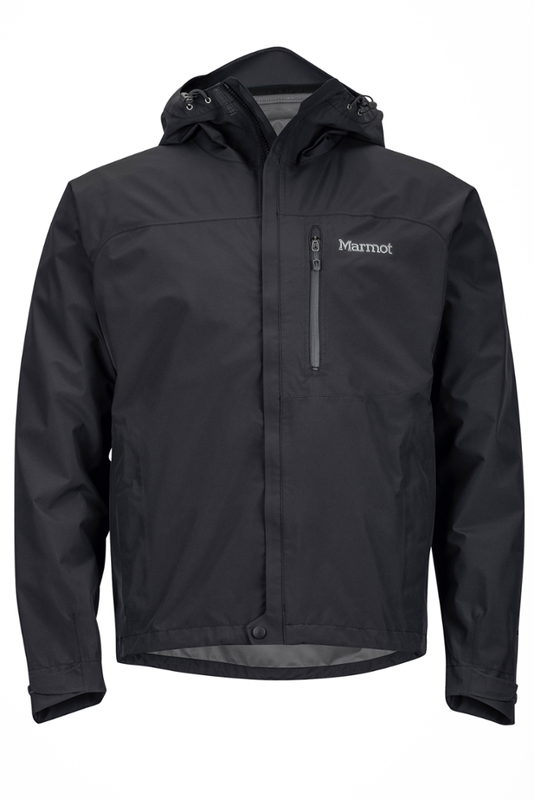 This jacket is super lightweight and very waterproof. I consider that I sweat about as much as the next guy, nothing major, but enough to get wet in serious activity. I would never wear ANY shell with a down sweater unless it were literally below zero with a stiff wind. Even my Goretex Pro shell doesn't breathe enough to keep me from getting wet. I have to totally stop the activity and rest for a while before my clothing even begins to dry out. Also, remember something important from high school physics; the concept of equilibrium. When it is raining, you are basically at 100% humidity, which means that the air outside is 100% saturated with water vapor. In this environment nothing will evaporate, including the clothing under a fully breathable shell. Folks, this is why it is important to carry extra clothing to change into if you get too wet, or at least have something that will insulate when wet! 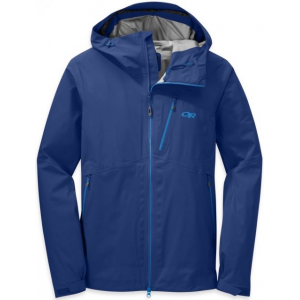 The Cohesion jacket is a good lightweight shell for moderate backcountry use. 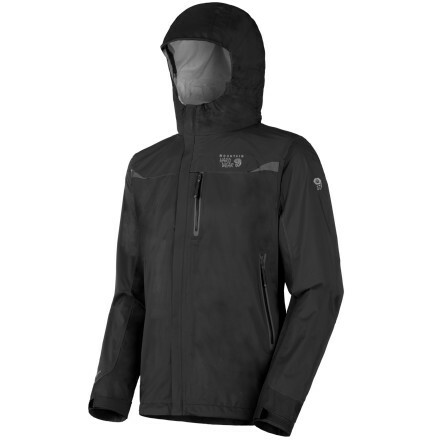 It is not a technical mountaineering shell, but it will work great for any daily backcountry adventure. The hood could use a bit more adjustments, and for that I deducted 1/2 star. 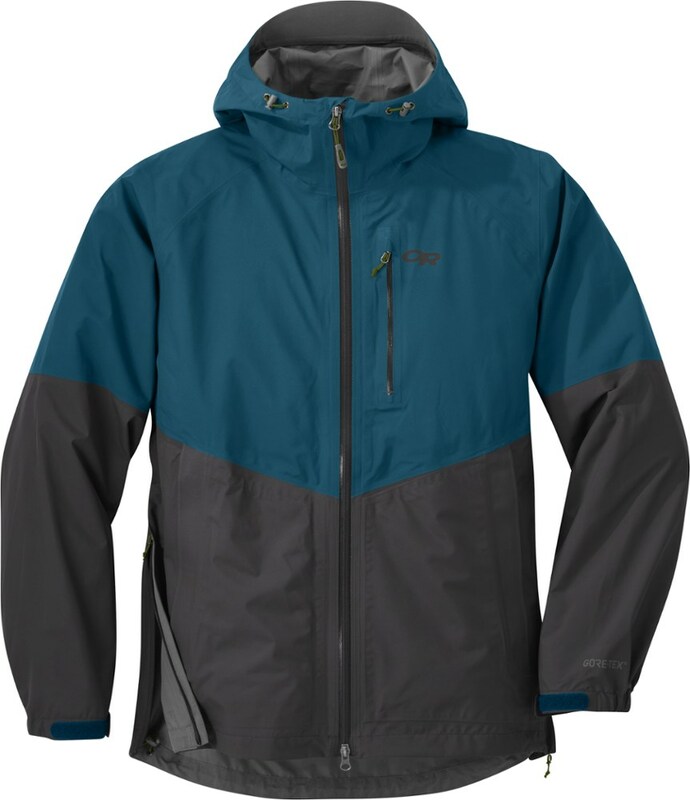 Pit zips with waterproof zippers are awesome and were the deciding factor for me with this jacket! It will be my go to shell for everything but alpine climbing. This is the best shell in this price range. Great lightweight jacket. Packs up small. One thing you need to understand about any and all rain jackets is the fact that they are designed to keep water on one side of the jacket and not the other. Which means it will keep rain out and it also means it will most likely keep sweat in. Too many fail to remember this when buying a rain jacket. If you are going to buy a jacket to hike in expect to get wet. This jacket will keep you dry. I wear mine around camp and any time I'm not camping. If I am hiking use a poncho. This is a great jacket. Don't be fooled by anyone with unfair expectations. I love it. Around camp I stay as dry as can be. Took this jacket back. It does not breath at all. Took this jacket back. It does not breath at all. You will be soaking wet from the inside out. Mountain Hardwear "Conduit" does not work as advertised. Just to give example: When worn with a down jacket underneath, after 1 hour hiking in snow the down jacket was soaked from sweat and useless. Good thing I wasn't on trail far from warmth. I gave this jacket over a year to make it work. I gave up. It's too bad, because I like the design and light weight. Mountain Hardware is some of my best equipment. Not this jacket, though. Took it back to REI and bought eVent jacket. Much better breatable fabric. 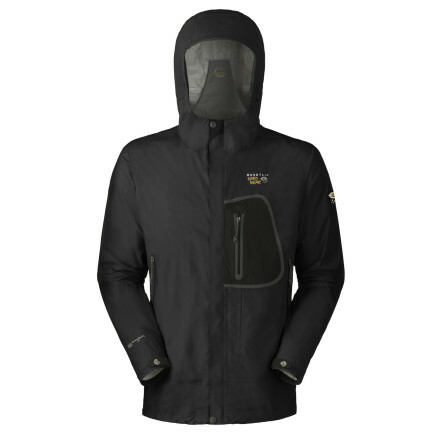 Obviously, the corporate reviewers did not actually don this jacket and take it out in the elements, and the reviews echo what is claimed on the manufacturer's website. 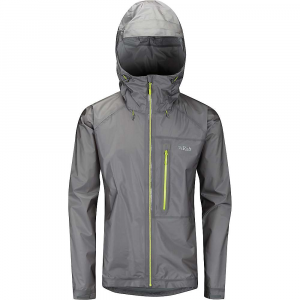 This jacket is totally waterproof from the outside in. Wear it in a rainstorm, and it will keep the rain from making you wet (perspiration not taken into account). Wear it in wet or dry weather while performing activities that generate perspiration, and the jacket DOES NOT PERFORM AS ADVERTISED. Its ability to keep rain out is matched only by its ability to keep perspiration in. The Conduit DT material feels like a plastic bag on the skin. Buyer beware. The manufacturer has a lifetime warranty on the product, which covers workmanship defects such as holes in the garment, broken zips, snaps, etc... but excludes warranty for false claims.